Thought Balloons - Creating Comics One Page At A Time: Why The Orient Express? Care of P.A., who is having some computer difficulties at the moment. About 130 years ago, this little train company started up. You might have heard of it. Compagnie Internationale des Wagons-Lits? ... Okay, maybe not. But I'll bet you've heard about their little train(s) that could: The Orient Express. Setting off for Giurgiu, Romania, le Express d'Orient left Paris on October 4, 1883, and even though the first train didn't exactly provide the most luxurious travel, that is exactly what The Orient Express and CIWL have become synonymous with. 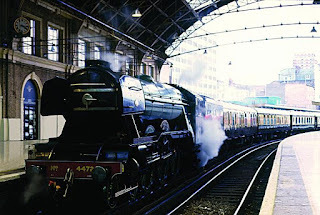 The train itself features prominently in Bram Stoker's Dracula, Ian Fleming's From Russia, with Love, and, well, Agatha Christie's Murder on the Orient Express. But, if literature isn't your thing, you still might have heard about it from Doctor Who, Chuck, Teenage Mutant Ninja Turtles, or every piece of fiction with a train in it produced after October 4, 1883. Roughly. Having said all of that, know that our theme for this week does not need to be taken entirely literally. If you don't want to write about a historic train, don't. Put it in space, or underwater, or through the center of the earth. Snowpierce it up. Just make it fancy! And, as always, if you're one of those people still standing on the platform, gazing longingly down the track, it's time to get that ticket punched. Too funny. We just watched that episode of Doctor Who last night and I thought about writing a train story of some kind. So we're coming into this after one page, when our honeymooners--named after myself and my wife--are taking the Orient Express in modern times and things get a little different. 2.1: Dave leads the two of them down the hall. Meg looks behind, she’s kind of struggling with her suitcase. 1. DAVE: Ticket says we’re number 42. 2. MEG: UGH, Okay. Can you walk faster? 2.2: Dave opens car door number 42. Inside there’s no space for them, because it’s a FISH BOWL. No seriously, the entire car is contained water and there are goldfish and clownfish, and little Doris, and a bunch of other fish just swimming around. 2.3: A SHARK clears the murky waters of the MARINE CAR and leaps towards them with a full row of teeth baring them! 5. DAVE & MEG: AHHH! 2.4: Dave has closed the door. Dave and Meg are looking at each other—a little bewildered. 6. DAVE: Maybe not that car? 7. MEG: Yeah, let’s try another. 2.5: Meg opens this next door now. Looking inside there’s a peculiar man in a suit with a tight little mustache and a hat, a round face standing over the body of a DEAD MAN in a suit. It’s HERCULE POIROT. 2.6: They shut the door again. Speech balloon extends through the door. 10. POIROT [OFF]: Hey, STOP right there. 11. DAVE: What the HELL? 12: MEG: We better get a refund. Some delightful imagery here, David. Imaginative and varied stuff, all the more so because of how grounded you start the whole thing out. Small thing, but in the context of the single page, I'd consider removing Meg's frustration with Dave's slow pace in panel 1. That antagonism doesn't come back into the story here and isn't really necessary. That said, the big ol' "NOPE" works really well. Fun stuff.